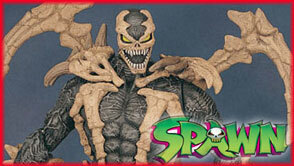 Spawn, Todd McFarlane\'s own creation, continues with Spawn Series 7 to be the backbone of McFarlane Toys. The very first figures we released were based on Spawn and it continues to be among our most unusual and successful lines. With this line, new characters from the Spawn myth emerge such as The Curse of the Spawn.